dress for adelaide | Flickr - Photo Sharing! hi amanda! those are strips, no? not just the pattern of the fabric? gorgeous!!! i'm inspired to try something like this now! yes, yes Strips of fabric! Lyn (Molly Chicken) did some of this amazing patchwork last week - you should check it out. Mine, on the other hand, was 'found' this way as a thrifted skirt. I love that style of patchwork! i love the circles. great patchwork. I love the dress. 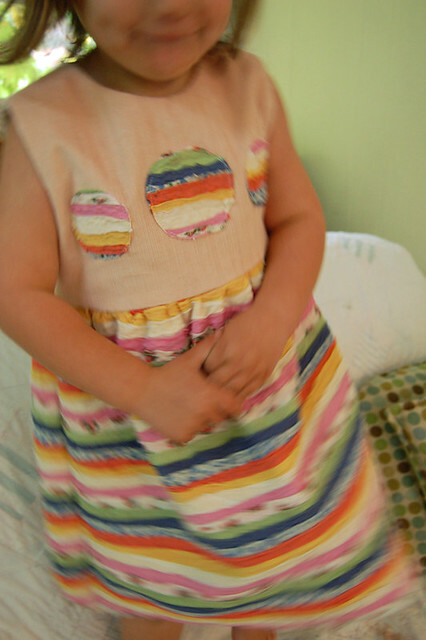 Aren't little dresses fun to make?